Home» AP GO's | AP LATEST UPDATES | APGLI GOs. » AP GO.NO: 36 APGLI Enhancement of Age of 58 to 60 years and Revision of Rates as on Revised Pay Scales - 2015. AP GO.NO: 36 APGLI Enhancement of Age of 58 to 60 years and Revision of Rates as on Revised Pay Scales - 2015. 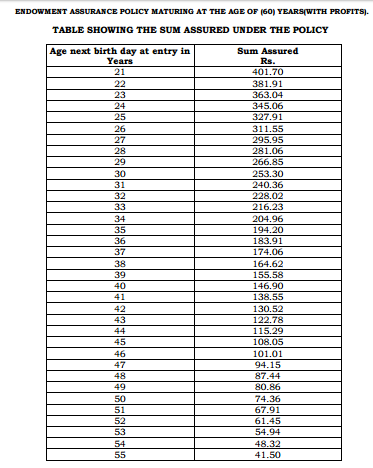 APGLI Enhancement of Age of superannuation from 58 to 60 years and Revision of Rates of Compulsory Premium with reference to Revised Pay Scales, 2015 as per GO.NO: 36 ; AP Government Life Insurance Scheme from (53) years to (55) years and Revision of Rates of Compulsory Premium with reference to Revised Pay Scales, 2015 – Orders as per GO.NO: 36 ; AP GO.NO:36 APGLI Enhancement of Age of superannuation from 58 to 60 years and Revision of Rates of Compulsory Premium with reference to Revised Pay Scales, 2015 ; AP GO.NO:36 2015 as per GO.NO: 36 ; AP Government Life Insurance Scheme from (53) years to (55) years and Revision of Rates of Compulsory Premium with reference to Revised Pay Scales, 2015 – Order. Order:- Andhra Pradesh Government Life Insurance Scheme – Endowment Policies – Enhancement of Age of superannuation from 58 to 60 years and introduction of AP Revised Scales of Pay 2015 - Enhancement of Maximum Insurable Age under AP Government Life Insurance Scheme from (53) years to (55) years and Revision of Rates of Compulsory Premium with reference to Revised Pay Scales, 2015 – Orders – Issued. G.O.Ms.No. 16, Finance (Admn.II) Department, dt: 17.2.2011. G.O.Ms. No.147, Finance (HRM IV) Department, dt: 30.6.2014. Lr.No.10/Genl/2014dt:11.08.14, of Director of Insurance, A.P., Hyderabad. G.O.Ms.No.368, Fin&Plg (FW:Admn.II)Department, dt: 15.11.1994. G.O.Ms. No.423, Finance (Admn.II) Department, dt: 29.11.2005. G.O.Ms.No.46, Finance (HRM.V-PC) Department, dt:30-04- 2015. Lr.No.26/Genl/2015 dt: 06.08.2015 of Director of Insurance, AP, Hyderabad. In the reference 2nd cited, the Government enhanced the age of superannuation of the State Government employees from (58) years to (60) years. Consequent to enhancement of age of superannuation from (58) years to (60) years and introduction of the Revised Scales of Pay, 2015, the Director of Insurance, in his letter 3rd cited, has sent proposals for enhancement of the maximum Insurable age from 53 years to 55 years and to revise the rates of compulsory premium based on the Revised Scales applicable to various categories of employees. The Government in the memo fourth read above, permitted the Director of Insurance to take necessary further action and submit detailed proposals after consulting the Actuary and the Accountant General, A&E, Andhra Pradesh. 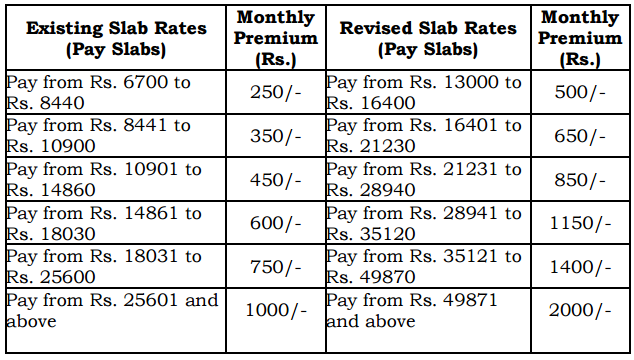 (a) All the employees shall increase their premium as per the revised rates specified above and submit requisite 'Proposal Form', after recovery of first premium from the salary at the revised rates and take an Insurance Policy from the Insurance Department. (c) An employee who is already a subscriber of the Fund having Policy / Policies, and is aged below (55) years can enhance the premium for additional policies. However, he should submit his application in the prescribed proforma before he actually attains the age of 55years. Under any circumstances proposal shall not be accepted if theapplicant has already attained the age of 55 years on the date of submission of his application, notwithstanding the fact that the amount was already deducted in the monthly pay bills. Such amounts shall be treated as unauthorized amounts and refunded to the individual following the usual procedure . Copy of this order is available on Internet and can be accessed at address http://www.ap.gov.in.goir.